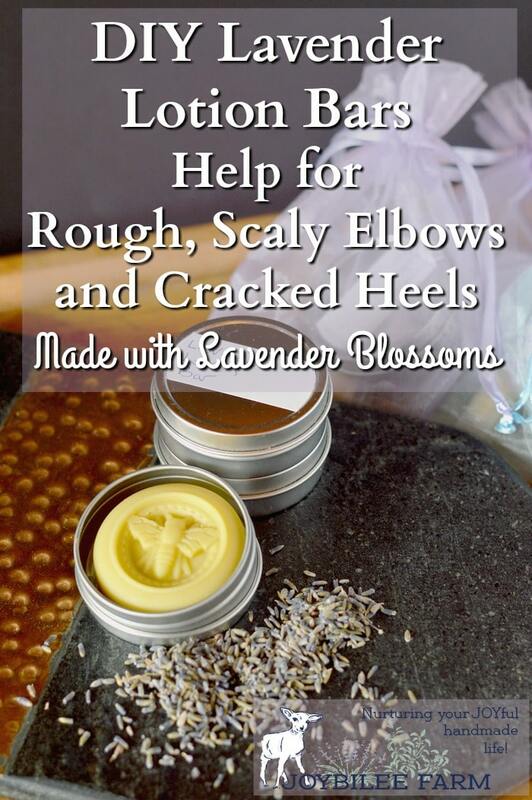 Lavender lotion bars are made with just a few ingredients but they offer long lasting protection for dry, cracked heels, rough elbows, and calloused hands. Here they are made better through the use of lavender infused oil. Summer brings with it another set of skin care needs. We’re no longer dealing with dry, wind-chapped skin. Summer skin is dry from the heat, or from air conditioned air. There is the additional need for softening callouses that come from garden work or lots of walking. Lotion bars offer a protective covering that seals in the herbs and botanical oils for longer lasting absorbsion. Lotion bars are solid at room temperature. They are created to protect your hands and feet and soften dry, calloused skin. Lotion bars are made of equal parts of liquid oils, beeswax, and botanical butter like cocoa butter or shea butter, both naturally occurring butters. There are other botanical butters available like mango butter and avocado butter. These other butters are made by hydrogenating the liquid oils into a margarine-like consistency through a chemical process. If you are looking for a natural alternative to commercial lotions and moisturizers you’ll want to stick to shea butter or cocoa butter in your lotion bar recipes. If you are allergic to some botanical oils see this post for ideas on substitutions for liquid oils and butters in lotion bar and body care recipes. I used lavender infused olive oil in this lotion bar recipe. Lavender is antimicrobial, anti-inflammatory, antifungal and soothing to dry, inflamed skin. It also offers some protection against mosquitoes and other biting insects. Lavender infused oil is not the same as lavender essential oil. 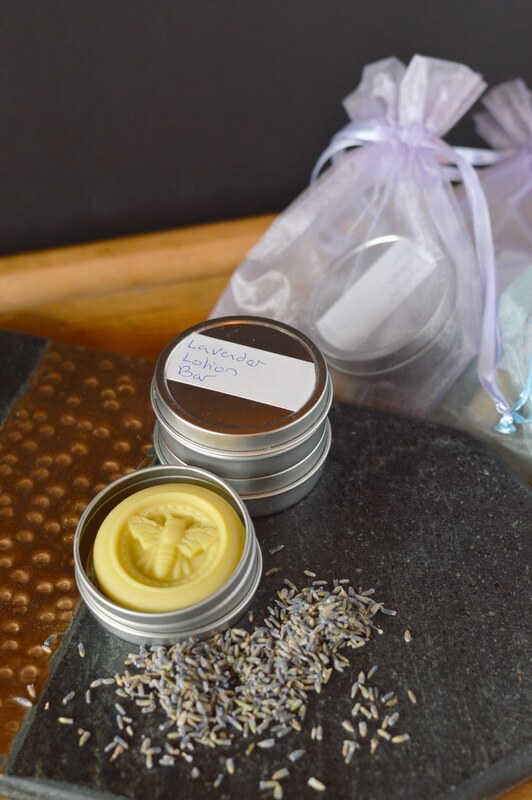 This recipe for lavender lotion bars uses both lavender infused oil and lavender essential oil. They bring different benefits to the lotion bar recipe. Lavender essential oil is the concentrated fragrance and volatile oils from the lavender shrub. The essential oil is antimicrobial, antifungal, relaxing, and mood enhancing. Lavender dried flowers are analgesic, anti-inflammatory, nervine, and increases blood flow to the skin, relieving pain and promoting healing. When both herbs and essential oils are used together in skin care preparations the benefits are increased. To make lavender infused oil, fill a pint jar half full of dried lavender blossoms. Cover the lavender blossoms in the jar completely with olive oil. Cap tightly and shake. Add more olive oil, if necessary to keep the blossoms covered. Shake daily for two weeks. After two weeks, strain through a muslin bag or fine tea strainer, retaining the oil. Press the blossoms to capture most of the oil. Discard the spent blossoms. They can be composted. Your oil is ready for use in this lotion bar recipe. Are you confused about lavender essential oil? There are several essential oils called “lavender” to choose from, are they all the same? Lavender essential oil comes from flowers of Lavandula angustifolia or English lavender which is the classic lavender in aromatherapy. 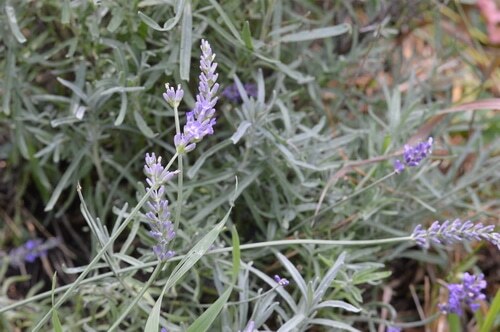 This lavender stands apart from other lavender types because it contains almost no camphor. This is the best lavender to use for skin care, bath products, and aromatherapy. This is the lavender essential oil you will want to use for this recipe. If you want to grow your own lavender, choose from the English lavender varieties at your garden store. 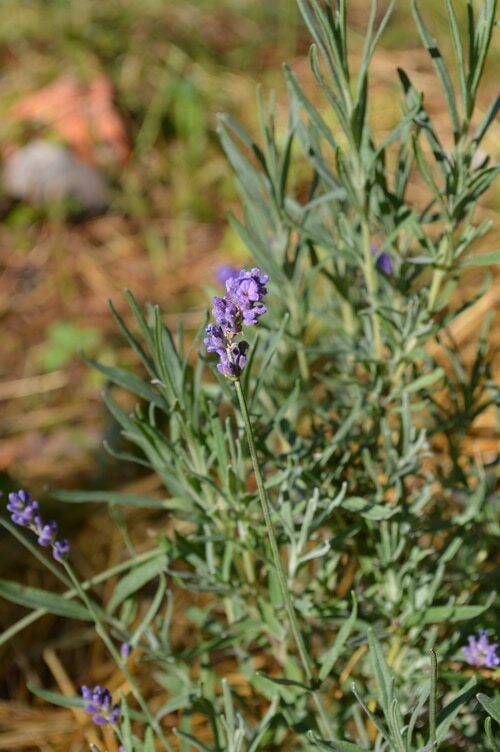 L. angustifolia is also the lavender used for culinary purposes. It is edible and when used as a spice is very similiar to the digestive and anti-nausea properties of rosemary, it’s close cousin. Spike Lavender essential oil is distilled from the flowers of Lavandula latifolia, a French lavender type. It has a strong camphorous note with its floral fragrance and is used predominantly in soap recipes, candle making, and perfumery. It’s also useful for essential oil infusers. The camphor scent relieves congestion. It is generally less expensive than lavender essential oil and is used in higher concentrations in perfumery with other essential oils. Lavender 40/42 essential oil is blended oil that has been standardized. While other lavender essential oils can vary in their fragrance depending on their growing conditions, lavender 40/42 always smells the same. To achieve this standard linalool and linalyl acetate, the two main fragrance compounds in lavender essential oil are added into the oil. Some companies add chemically identical artificial fragrance oils to this essential oil to achieve a homogenous fragrance. This is the least expensive lavender essential oil. Use lavender 40/42 in candles and soaps. Avoid this one for skin care purposes as the potential for artificial fragrance that can trigger allergic reactions is present. This is the lotion bar recipe I use most often, although I vary the herbs in the infused oil according to the needs I have when I make it. This is the basic recipe that you can build on. The key point is to keep equal proportions of liquid oil, botanical butter, and beeswax. This hard lotion bar is solid even in summer temperatures but will melt on contact with your hands. If you are a “cold person” try holding the bar in your palms for a bit until the outside layer of the lotion bar softens and then rub the lotion bar into your palms and apply it where you need it for extra protection and skin repair. This makes a lovely gift for friends, mothers, daughters, and grandmothers. Make a double boiler using a glass measuring cup, a saucepan, and a canning jar ring. Put the lavender infused oil, shea butter, and beeswax into the measuring cup. Put water in the saucepan so it reaches halfway up the side of the measuring cup. Simmer over low heat just until the beeswax melts. Stir the ingredients together to blend the beeswax into the oil. Remove from heat. Stir in essential oil. Pour into prepared molds. Allow to harden at room temperature. Remove the lotion bars from the mold and wrap in parchment paper. Place in 2 ounce tins for gift giving. I made up a double batch of this recipe for Mother’s Day this year, and passed out 2 ounce tins with lotion bars to my girlfriends to bless them. I included a coffee eye cream with the lavender lotion bars. Both recipes are inexpensive to make. Once you have the ingredients on hand you can make a batch quickly — in less than 15 minutes. The hardest part is deciding which mold to use and what kind of pretty packaging to play with. Hi, as i am from a country that is warm all year long, i doubt that i’ll be able to keep these bars in solid state. instead, i lessen the amount of beewax to 1:2:2 ratio (eg, 1oz beewax to 2oz coconut oil to 2oz shea butter) and plan keep them is a small aluminium tub. the outcome is quite satisfying, except the fact that i found that there are spots that are relatively softer than others. I made another one with 1:4 ratio (1 part beewax with 4 part coconut oil), but din see the same issue. can you let me know where did it go wrong? Erin, you probably just need to blend the oils and beeswax more thoroughly after you melt them together. The beeswax should be completely blended with the oil before the lotion bar solidifies. 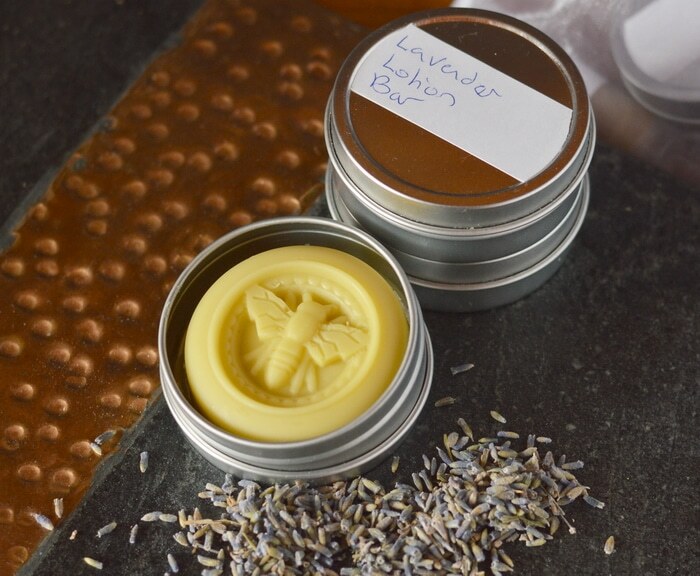 You’ve actually made a salve rather than a lotion bar by adjusting the beeswax ratio. Hi, thanks for the reply and answer. but before i remake a new batch, can you let me know how to ensure that the beewax are completely blended? I am having trouble with my bars being too soft… I use cocoa butter, coconut oil and beeswax in equal parts. Can you help me out? If you live where it’s very hot right now you may need less coconut oil or more beeswax. Cocoa butter melts at body temperature so if your ambient temperatures are hitting 97 you’ll have almost liquid lotion bars. You could increase the beeswax for a firmer bar. I have lots of lavender in my garden but I am new to drying and using herbs can I dry the leaves as well as the blossoms for the infused oil ?? ?